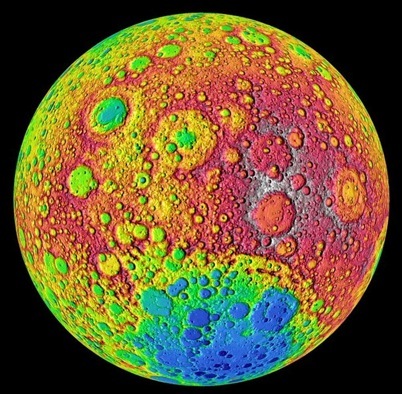 Psychedelic moon… contrib by Lori C.
The Lunar Reconnaissance Orbiter’s LOLA laser altimeter produced this color-coded image of elevations on the far side of the moon, which cannot be seen from Earth. The highest elevations, above 20,000 feet, are shown in red. The lowest elevations are shown in blue. Oh, that’s strange…. hehehe, sometimes it’s from the network or the kind of browser we are using that things happened like this.